PortaOne and Telebreeze have successfully completed a combined middleware OTT / IPTV platform integration deployed by Broadlink, a Nepalese Internet service provider. As a result, Broadlink efficiently manages all of their services, including voice calls, Internet access and IPTV with fully integrated platform. Why did Broadlink as a service provider need a triple play billing? Inaugurated in 2006, BroadLink Network & Communication Pvt. Ltd.was the first Nepalese ISP to offer data and voice products together in a bundle. The company’s initial objective was to provide internet and telephony products nationwide, with plans to add IPTV offering later and make it a full and market competitive triple-play solution for home users. From its very beginnings, Broadlink has been operating in just about every main city throughout Nepal and is still in the growth stage. PortaSIP®, a class 4 and 5 softswitch. "At Broadlink, we strive to improve the lives of our customers every day with innovative PortaSwitch-based services. Innovation is our driving force and our processes are designed to meet Broadlink’s vision and our customers' expectations and to develop win-win relationships." Back then, Broadlink managed over 30K data customers and approximately 500+ voice clients. The company needed to grow its business, provide a larger diversity of offerings and become a telecom unified service delivery platform, which is why it was looking for a flexible and reliable network infrastructure. Cost-efficiency was one of the main requirements as well, since Nepal is still a developing country. Therefore, they sought a single adaptable, powerful, and solidly built solution that could manage billing, invoicing and routing, simultaneously on the same platform. After bundling all these into one, they anticipated aggressive growth. With the PortaOne — PortaSwitch single product, the perfect solution for everything mentioned above materialized. Why did Broadlink choose PortaBilling for IPTV billing? In 2016, years after the beginning of the cooperation with PortaOne, Broadlink decided to add over-the-top / Internet protocol television (IPTV and OTT TV) to their list of proposals. They viewed the capacity of PortaOne’s platform as the obvious choice. Broadlink regarded PortaOne’s customer service as the best on the market. That was the foundation for their decision to continue developing propositions on the PortaOne platform. Already in possession of a license for PortaBilling®converged billing, the company only needed to find the right content management system to integrate. They chose Telebreeze, the leading developer of software products for IPTV / OTT worldwide. Founded in 2011 by a team of video encoding experts, Telebreeze provides professional software-based solutions for video broadcasting worldwide. Telebreeze’s OTT / IPTV platform (including Coder, Middleware, Media Server, Multiplatform Player and VoD) already works for 120+ projects in 55+ countries around the globe. A variety of monetization tools lets TV operators gain extra income with Telebreeze solutions. Broadlink needed to set up a headend station with everything IPTV project required for normal functionality, e.g. satellite dishes, IP feeds, encoders, transcoders, MPEG 2/4 and middleware servers, and then integrate it all with the company’s ISP network. In Telebreeze they found an excellent solution. Telebreeze has since installed and launched IPTV and OTT TV software for a head-end station with live broadcasting and Voice-on-Demand for more than 800,000 subscribers in Nepal. The solution was successfully integrated with PortaBilling®, and that has since given Broadlink a complete system that includes billing, content and subscriber management tools simultaneously. customized IPTV billing solution was created from scratch, specifically for a particular client request. satisfaction by delivering advanced television. "We need to constantly be able to cope, compete and update with the rapid changes that evolving technology has brought into people’s lives. With PortaBilling®, it has been easy to bring such new services, ideas and schemes that can be bundled into our existing plans to our products to add value and differentiate us from our competitors. How does PortaBilling help to beat the ISP competition? For telecommunication companies, triple-play services is not just a buzz phrase; it is the only way to remain current and competitive and retain customers. There will always be someone who will offer cheaper Internet access, so the only way to win the competition with other ISPs is to provide value-added services like IPTV. With the PortaBilling B/OSS platform, telephony and Internet SPs can add IP Television, Video on Demand (VoD) and pay-per-view offerings to their portfolios that help promote the business growth. Nowadays, end users do not want to receive separate invoices for voice, data and TV. It’s much more convenient for them to pay for everything all at once in one transaction. Once a service provider can offer a triple-play solution, it automatically becomes very attractive and customer friendly. With a single account, an end user will be able to send SMSs, watch TV, browse the Internet and make voice calls. PortaBilling® can import, invoice and rate xDRs (x Data Records) for any type of services, including VoD billing events from any external source, such as the Telebreeze platform. Its flexibility supports all kinds of business models, from channel package customer subscriptions with fixed monthly payments to premium content pay-per-view IPTV in real time mode. B/OSS-to-middleware integration is usually done with some type of web services API. The same method was used by PortaOne before. Via the PortaBilling® web interface, all charges can be added to a customer's invoice, including those for internet access, voice calls, etc. This improves the customer's experience, makes system handling and tracking of account payments much easier and additionally, reduces operating expenses. The majority of PortaOne customers are independent service providers, and their chief tool for competing with incumbents is the ability to give end users the services that they want, faster than anyone else on the market. Kasenna (now part of Espial), provides IPTV platforms for new video and other services delivery to enable service providers to maximize their profit. Minerva is a leader in supplying multiple content sources, networks, applications and devices, thanks to which service providers can increase market penetration, grow their revenues and build customer loyalty. MatrixStream introduced a DVD quality IPTV streaming platform. These days it is still a forward-moving IPTV software pioneer. PortaOne is committed to excellence and continues to provide a product that constantly progresses to fit current and continually changing market demands. According to that, the introduction of any kind of new service must be done under the latest version of the platform (so-called maintenance releases). This adds to the system’s stability to remain undamaged and circumvents the breakdown of current processes. New maintenance releases are delivered every two months, on average. How does PortaBilling work as a IPTV billing platform? To begin providing services, an administrator configures the plans and packages within PortaBilling® and defines the charges applied to customers for using them. 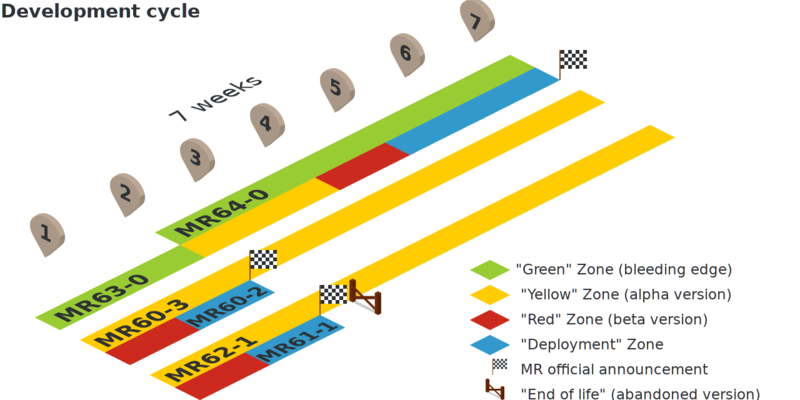 The entire configuration is done in one place via the PortaBilling® web interface. Once configured, PortaBilling® monitors customers’ service availability, individually, manages balances and creates reports in real time. To keep clients informed about exactly what they are paying for, PortaBilling® collects billing events, such as the data from the services provided to a customer (i.e. length of voice calls, data usage or watching pay-per-view content), creates detailed transaction and real-time billing reports, changes the customer balance, and performs ratings for the services provided. 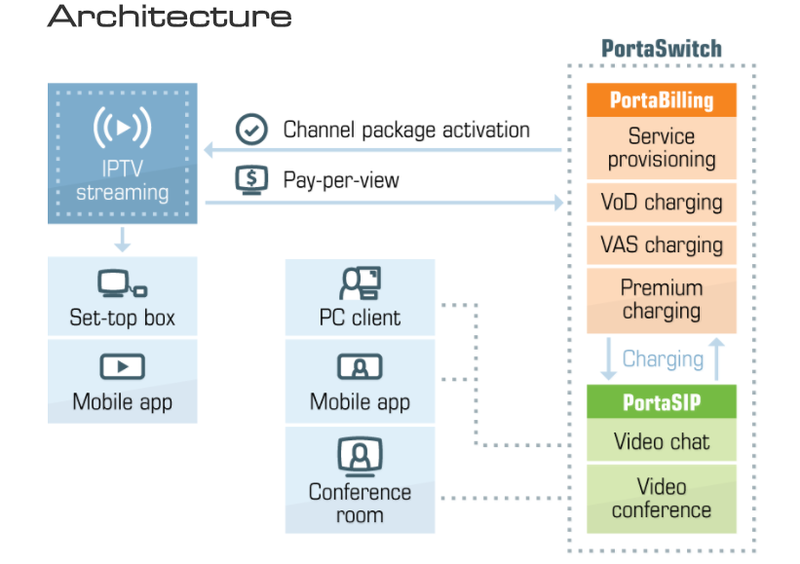 PortaBilling® ensures that different IPTV subscription packages are correctly mapped into channel bundles in a delivery platform and correctly integrates them into a single bill with other offerings (e.g. Internet telephony, messaging or data transfer). With all of the above, service providers can market better, work with different groups of customers and enjoy versatility in their pricing. How is PortaBilling different from other B/OSS solutions? PortaOne employs a technical team of about 300 people, the majority of whom operate exclusively in engineering and quality assurance. They work 24 hours a day, 7 days a week to make sure that everything performs well. If any issues emerge, customers know where to find help — they can always call or write the support team with questions. PortaOne oversees the support of the platform to ensure that clients receive the functionality they require. PortaBilling®, unlike many others, has proven itself to be a single infrastructure product that is ready to be used for various purposes. "We have received fantastic service from the PortaOne technical support team. The onsite training conducted by a PortaOne training engineer at our headquarters in Nepal went impressively. Furthermore, PortaOne’s support team has been highly professional and genuine in handling and solving any trouble tickets that have been raised.